Sunday, April 7, 2019 at 2 pm in the P.E.I. Humane Society’s Community Room, located at 309 Sherwood Road, Charlottetown. Please use the new entrance located at the rear of the building. The meeting will include the presentation of two annual reports: a financial report from the Auditor and a general report on the affairs of the organization from the Chairperson. The election of a new Board of Directors will also take place at this meeting. All members who paid membership dues prior to December 31, 2018 will be eligible to vote and/or run for a board position at this meeting. The agenda for the meeting will also include an overview of current and recent CAT activities, news, and events. As usual, there will be lots of opportunities for volunteers to sign up to help out! Annual membership dues of $10.00 will be collected for 2019 at the AGM. Cat Action Team would like to announce a big happy congratulations to Robert Corcoran for being our lucky Mother’s Day Quilt Winner !!! Thank you Sandy for drawing the winning ticket and a huge thank you to everyone who purchased tickets and played a role in making this fundraiser a fantastic success !!! The Cat Action Team has TNVR (trap-neuter-vaccinate-return) clinics scheduled this month and several cats and kittens will be treated for parasites, vaccinated, spayed or neutered, tattooed for identification, and then returned to their caretakers. If you would like to help “fix a feral,” too, contact us http://cats-pei.ca/cats-fix-feral-program/ . responded to innumerable concerns related to feral, stray and barn cats from communities across PEI. If you know of any cats who need our help, please contact us. Spay and neuter assistance for house cats (as well as dogs and rabbits) is available through our companion organization, SpayAid PEI. CAT proudly participates in the Companion Animal Welfare Initiative (CAWI) of the PEI Department of Agriculture and Forestry. 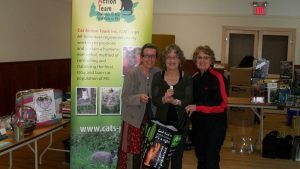 If you would like to volunteer with the Cat Action Team, please fill out the volunteer form. Web Design and Hosting provided by Mumford Connect Web Design.